Finnally got a new camera. Its so awsome. Everything is so clear and its much easyer to take pictures. I even got photoplusx4 its very complicated. The puppies personalitys are each comming out more everyday. You can even see their personalities in their photos. Sign Our Guest Book Before You Leave!! Iam A 20 year old with a passion for pets. Since I was little I always loved animals. I hoped to one day turn my animal loving in to a job I would love and here it is. 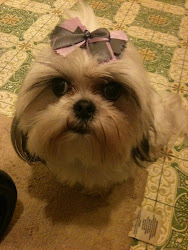 I make well tutus and bows for pets. Tho most people find it funny or want to know why a 20 year old would be intrested in this. I can't tell you why. I just love it. The more I practice the better I become. I am working on my photograhery and who knows that may turn in to another hobby. Iam still looking for what I want to do in life. Will I be a chef? vet? Who knows I have my whole life ahead of me. Chocolate Kisses. Watermark theme. Powered by Blogger.